One of the best features of Windows 7 is that it lets you create a repair disc so that you can use it when you encounter problems with the installation. You can use this recovery disc to access system recovery options. 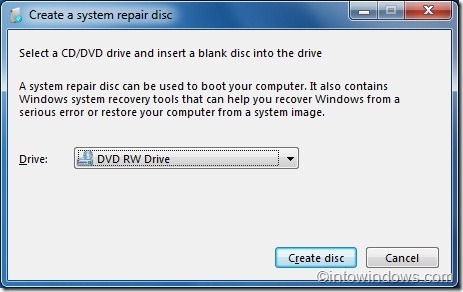 We have already covered how to create a system repair disc in Windows 7. Unfortunately, Windows 7 doesn’t allow you to create a bootable USB flash drive. So, in this guide, we will show you how to create a bootable Windows 7 recovery USB flash drive. The procedure is simple and pretty much similar to our how to install Windows 7 from USB flash drive guide. And the best thing is that you don’t need a Windows 7 installation DVD to create this recovery USB drive. 1. 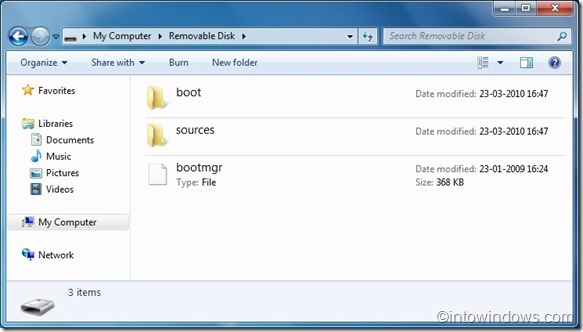 Type create system repair disc in Windows 7 Start menu search box and hit enter. 2. In the resulting dialog box, select your DVD drive. 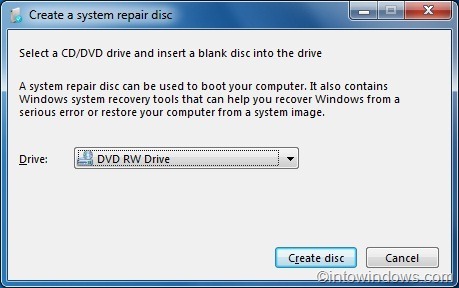 Insert a blank DVD into the DVD drive and then click Create disc button to start creating your Windows 7 repair disc. Wait for a few minutes to complete the burning task. 3. 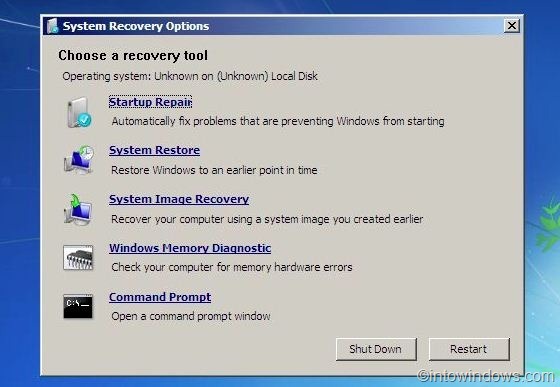 Once you have your Windows 7 repair disc, you can now create a Windows 7 recovery USB drive. Plug your USB flash drive and make sure that you have no data on the USB drive as we are going to format it. 4. Open Command Prompt with administrator privileges. To do this, type CMD in Start menu search field and then hit Ctrl + Shift + Enter. Alternatively, go to All programs, Accessories, right-click on Command Prompt and then select Run as administrator. 5. In the command prompt, you need to execute the following commands. Now, type LIST DISK and press enter to see the list of disks attached to your computer. In the next step, you need to select your USB flash drive that you are using to create system recovery drive (in this example, we are selecting Disk 1). From now on, type all the following commands one by one and then hit enter (again, please make sure that you are replacing the DISK 1 with your Disk number). 6. Now, insert the previously created repair disc and copy all the contents (contains three items) to the USB flash drive. You have just created a bootable Windows 7 recovery USB drive. Good luck! Method 2: Users who don’t like to burn a DVD can refer to this method. 1. 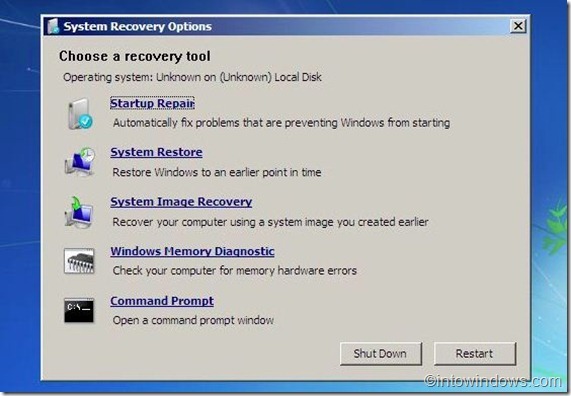 Download Windows 7 Recovery Disc ISO file. 2. Follow the procedure given in step 4 and step 5 (under Method 1). 3. Extract the ISO file contents using WinRAR or 7-Zip to your USB flash drive to create your USB recovery drive. 4. Before you restart your PC, you might need to enable USB booting feature in the BIOS settings. ……………. I have commanded this text but accidentally I have had lost my 2nd HDD (all graphics data)……… So I like to request you please help me How can get back my data from the drives. ” How to boot via USB without a repair disk” … Step 1: Make a repair disk. Thanks a ton. While helpful it won’t help on this pc because the original hard drive was dead. I have only a new blank hard drive to work with. No recovery cd etc. I ordered Windows 10 & support helped me convert the Windows 20 download to a bootable DVD so now I can install from DVD which is in my boot list. Hey, this totally solved my problem of creating a bootable usb stick. format fs=ntfs quick was not even mentioned in this article. Mediocre. BUMP Jim’s Sept. 24th post. I’m having the same problem. Argh! I’m a little confused and could use some help. I can not enter the windows at all… I stuck at [ bootmgr is compressed ]…. How can I fix it? I don’t think I can even reach the command prompt… I can only start and restart repeatedly…. Please help me…. format fs=ntfs diskpart has encountered an error the parameter is incorrect,.. If you can get a copy of the Windows 7 Repair Disk ISO (ask a friend or search for a torrent *cough*), you can partition the USB (search GParted) on a Mac and extract the files just fine. Hello. Recently, my brother broke his computer. It wasn’t able to boot properly, so he gave up and bought a new computer. I was looking forward to restoring it and making it my own. However there are 2 problems. 1. I don’t have a restore disk. 2. I could use these instructions, but I have an iMac, and it appears you need a Windows computer to get this done. Help? I keep getting BOOTMGR is missing Press CTRL+ALT+DEL to restart. I don’t have the recovery disc, so i have to use this method. After formating my removable storage, what is exactly location files should i put. Please tell me what files do I need to put inside my removable storage? And after put all the files, what i need to do? The link provided in step 1 of method 2 is not the Windows 7 Recovery ISO, but some Linux thing that I do not trust. Waste of $$$ – fix the link or be upfront about what the linked ISO is.. I have a question, what do I do next? Sorry for being a COMPLETE idiot but I do not understand how to use it. Also, can I use this to return my PC to factory state and if so, how? For me this did not work. The system tries to boot from the pen but givens an /boobt/bce file error. And then it asks you to insert the installion cd instead, because whatever it failed to read the boot information from the pen. I just managed to make this work with windows 7 USB/DVD tool – no need to go through the cmd hassle. This guide should be ammended with this advice, just like the install windows 7 from usb was. Just download a system restore disk .iso from the internet and select it in windows 7 USB/DVD tool. It will perhaps complain that the iso file is not valid. If so use a free tool like gburner, go to properties menu and make sure only UDF is checked. Then save the .iso file. Now you will be able to open it in Microsoft official usb bootable tool. Tada, simple and aeasy. Can this be used in combination with the official windows 7 USB/DVD tool? So instead of having to prep the USB with cmd tools you just use the user friendly tool from microsoft? thanx i applied it n it worked to perfection. After reading through the entire post I still have the following doubts. Firstly, does downloading the Windows 7 ISO and transferring it to the usb works for the windows 7 starter editions too?? 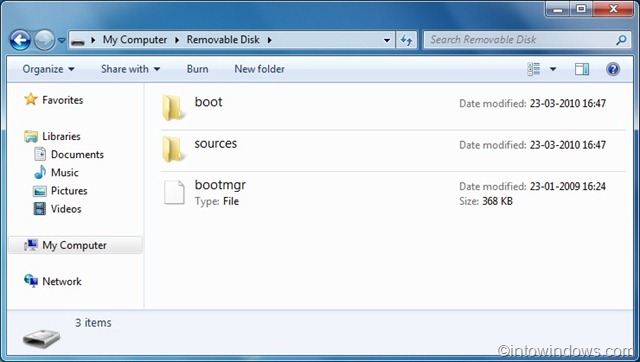 Then, after creating this bootable usb, can i remove the recovery partition from my HD?? And finally, will the above mentioned USB(after its creation) be able to restore my system if i completely remove windows OS?? This was unbelievably awesome. After spending way too much time trying to get UNetbootin to create bootable Windows ISOs, this took less about ten minutes. I guess Windows begets Windows. This article only helps if you actually CAN get into windows 7 already!? Step 1: “Type create system repair disc in Windows 7 Start menu search box and hit enter.” .. what?? FAIL. I CAN’T GET INTO WINDOWS 7! How can I access the windows 7 Start menu search box if I can’t get into windows 7??? Thankfully I have a dual boot system with xp so I can still use my pc to write this heart warming response to your unhelpful article. Nothing personal, but this didn’t help at all. i did what was written but when i finshed and closed command prompt when i try to open my flash drive “please inset a disk into removable disk (F),, is there anyway to restore my flash drive back !? I got this Recovery. But when I load it, The System recovery option is stuck. I cannot get to the next step. Please help. This worked like a charm on a Windows 7 netbook where I trashed the MBR installing a Linux dual boot, but did not have a portable DVD to boot the netbook. I blindly followed these instructions and I am now waiting for my usb drive to format, I’ll point out that you can save yourself 5-20 mins(depending on usb size) by doing a quick format instead of a full format. is it okay if i format it to fat? hope to hear from you. cheers! thank you3X . everything works find now. this guide help me a lot. This really helped me out after I used GParted to repartition my hard drive, after which Windows wouldn’t start. If I’d have looked up what to do, I would have known what was coming, but I’ve never been one for instruction manuals. Anyway, thanks a lot! You can any one version (x32 or x64) to repair both versions. This looks bang on. However, is there an easy way to put both the 32-bit and 64-bit repair disks on the pen, and then choose between at boot?